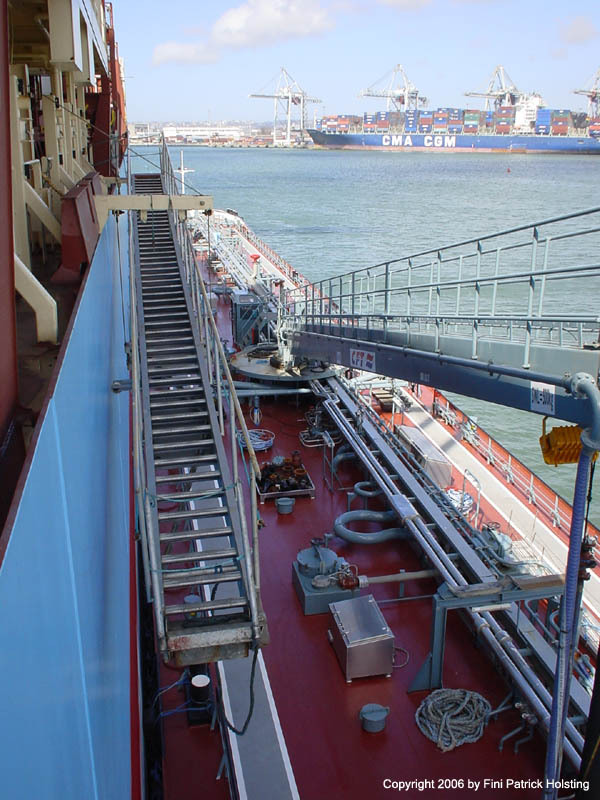 Bunkering (refueling) heavy fuel oil (HFO) in the port of Le Havre in northern France. 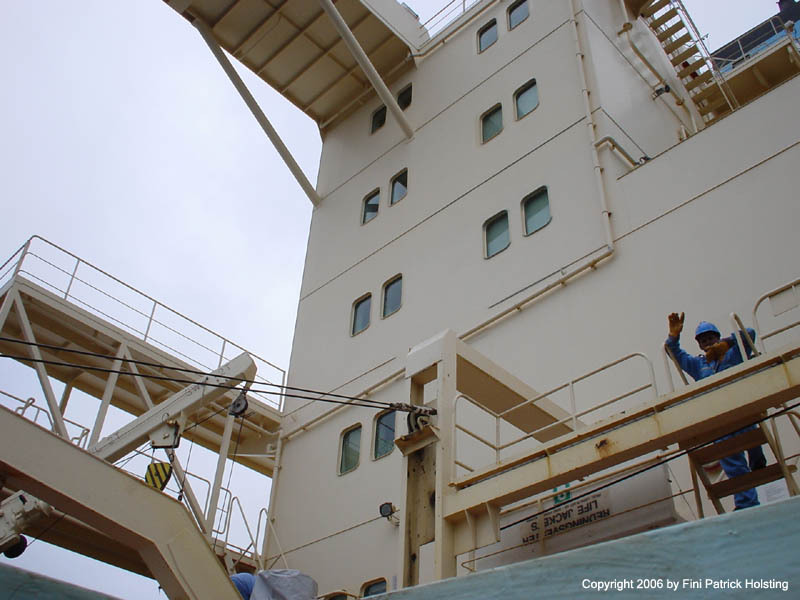 The so called bunker barge is moored alongside the ship and bunkering takes place during cargo operations. We usually bunkered up to 4,000 tonnes on each visit to Europe. On the other side of the ship the gangway has been set to establish connection with shore. Looking ahead from the top of the gangway. 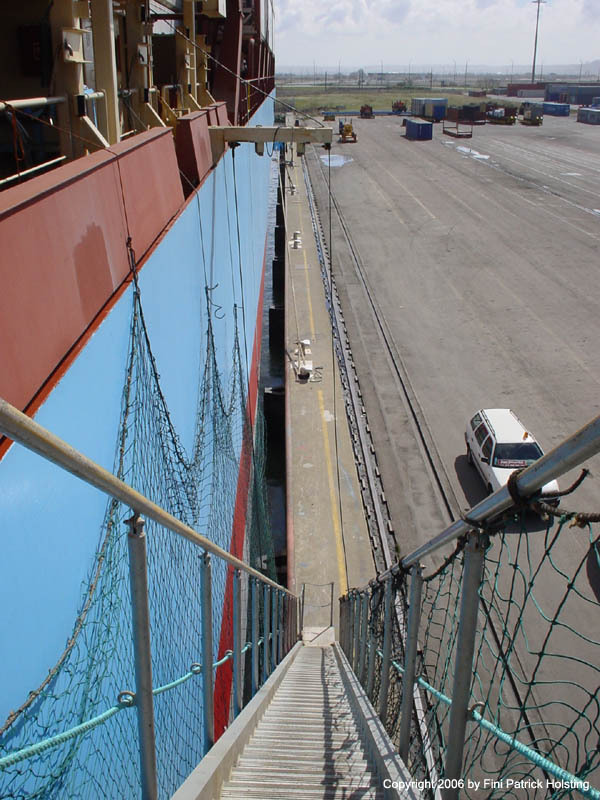 To the right is the pilot ladder and -gangway combination, an extra smallar gangway used in combination with the rope ladder to allow the pilot access to and from the ship when approaching or leaving port. Normally the pilot embarks from a small pilot boat, which comes alongside the ship when making slow ahead way outside the port. Overlooking the forecastle (forward mooring deck). 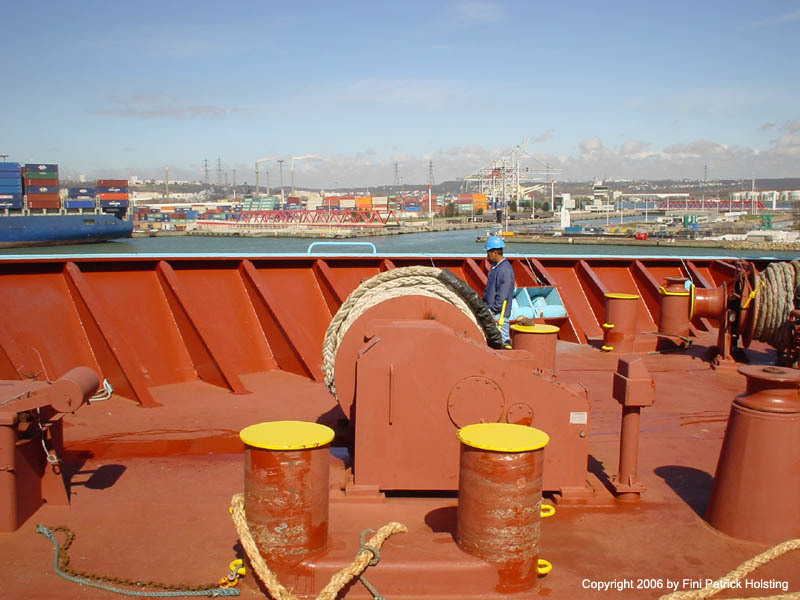 One able seaman is checking the mooring ropes during his deck rounds. 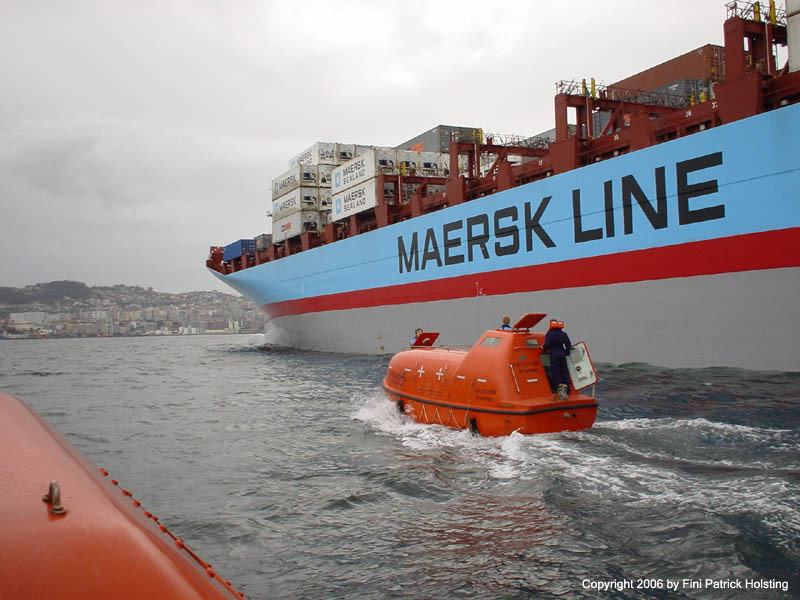 Lica Maersk has five winches forward and five aft. 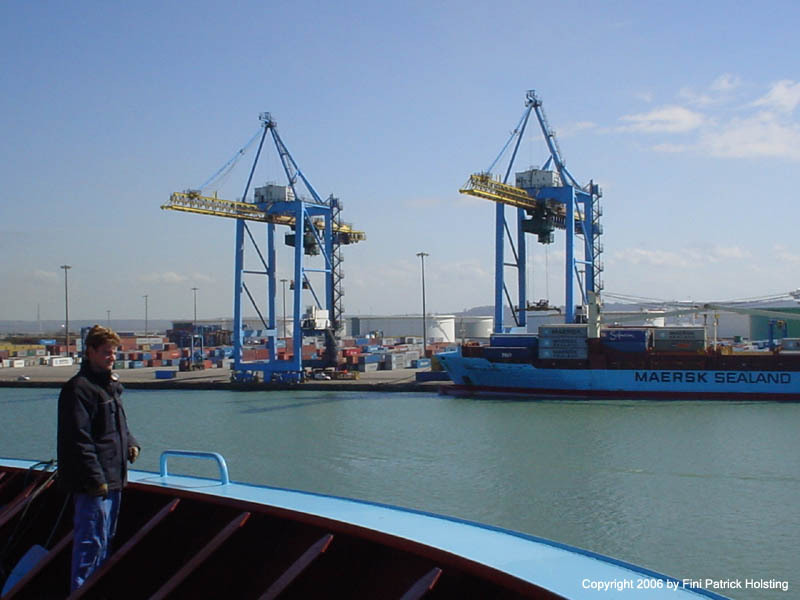 He're I'm standing in the bow of the Lica Maersk after departure from Le Havre, having a look at a smaller Maersk container feeder on our port side. Usually crew remains in the bow until the ship is out of the port in order to be ready to drop the anchors in case of main propulsion failure, and the ship has to be emergency stopped. 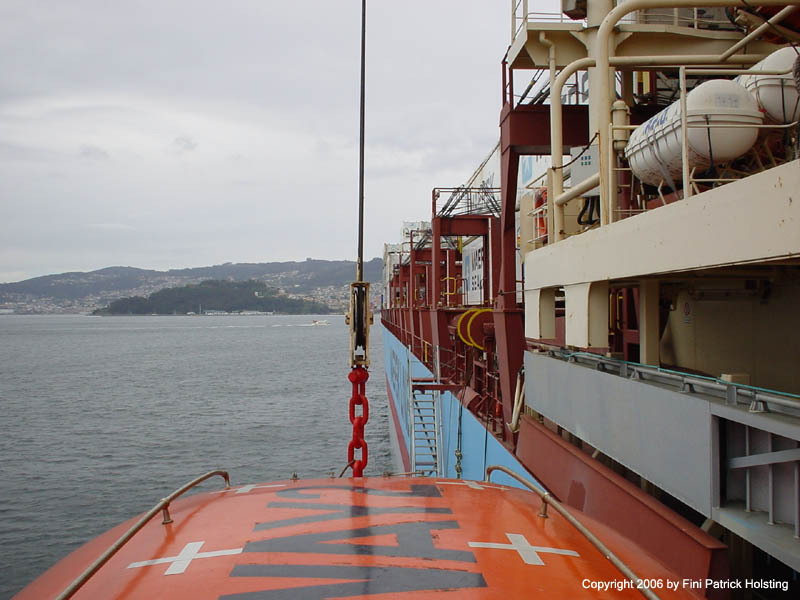 Back at Vigo, Spain we encountered some port congestion, and spent some hours at anchor just outside the port. 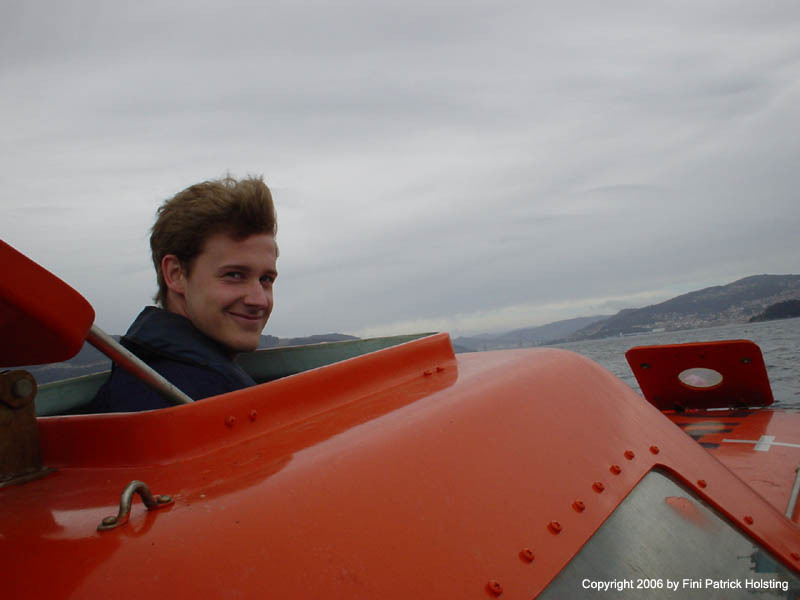 This provided an exellent opportunity to test the two life boats and the man-over-board-boat (MOB-boat). These tests have to be carried out at certain intervals. 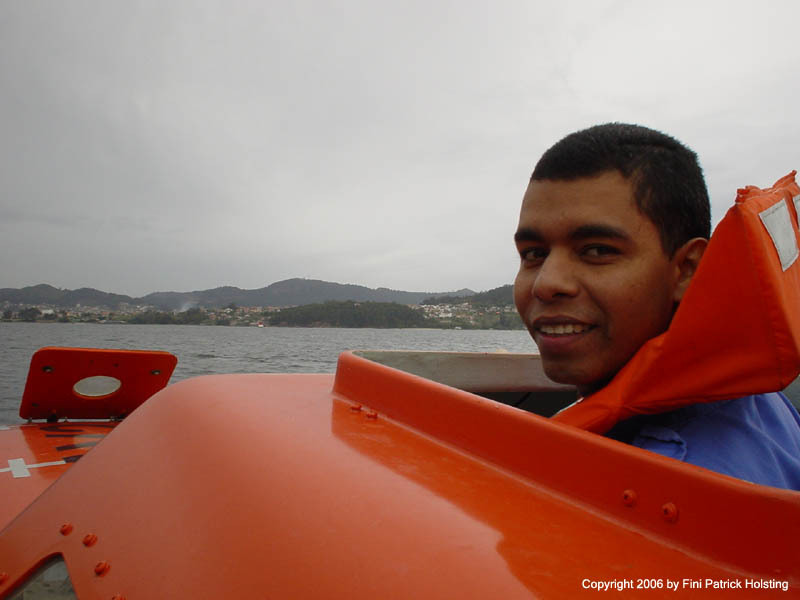 Brazilian deck cadet Igo at the helm of one of the life boats. He has opened the top hatch in order to stand up and look out over the boat. 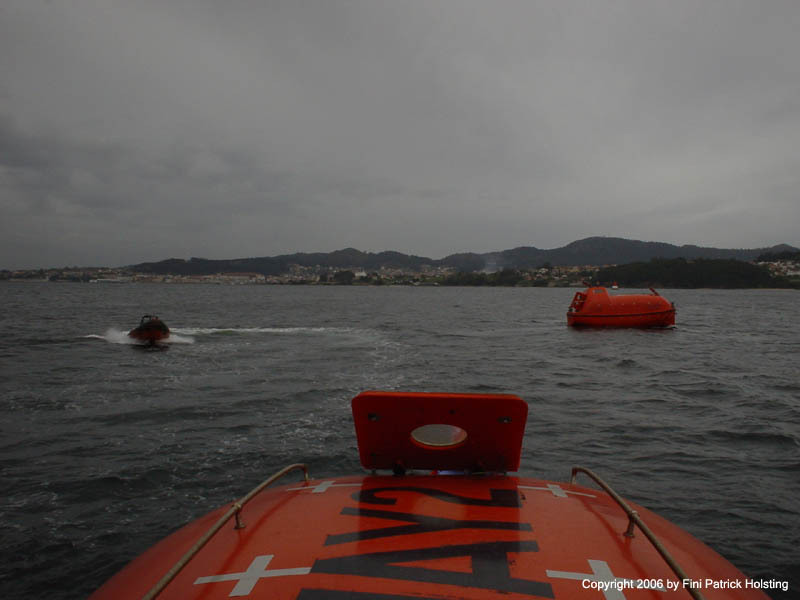 The life boat can be sealed completely watertight and still be operated from inside. All three boats in the water, as we did a "race around the mother ship". It was good fun and a nice break from busy coastal schedules and port maneuvers. We took the opportunity to replace some worn reflex tape on the life boats, the Chief Officer steering the MOB-boat and fellow Maritime Officer Michael (standing in the bow hatch) commanding the life boat. I was in charge of the other life boat. In the background the Lica Maersk. 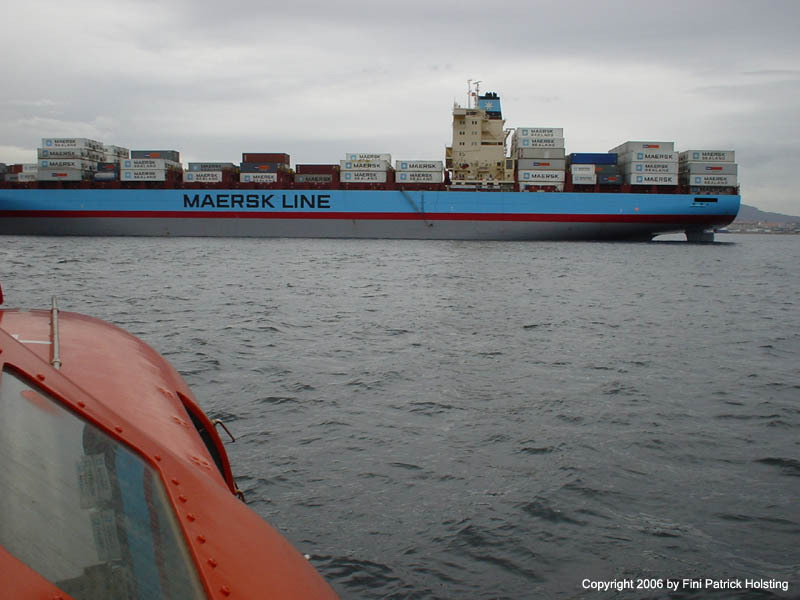 My turn to steer, as we headed back towards Lica Maersk. The life boats have enough fuel to travel for 24 hours at 6 knots and have food and water for the whole crew for several days. 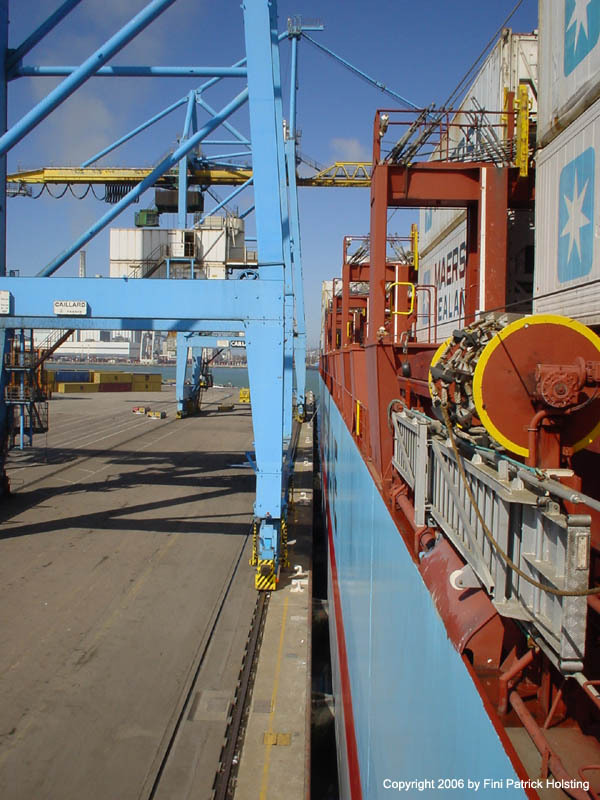 Approaching the port side of the Lica Maersk. The pilot combination had been rigged as visible just in front of the accommodation. 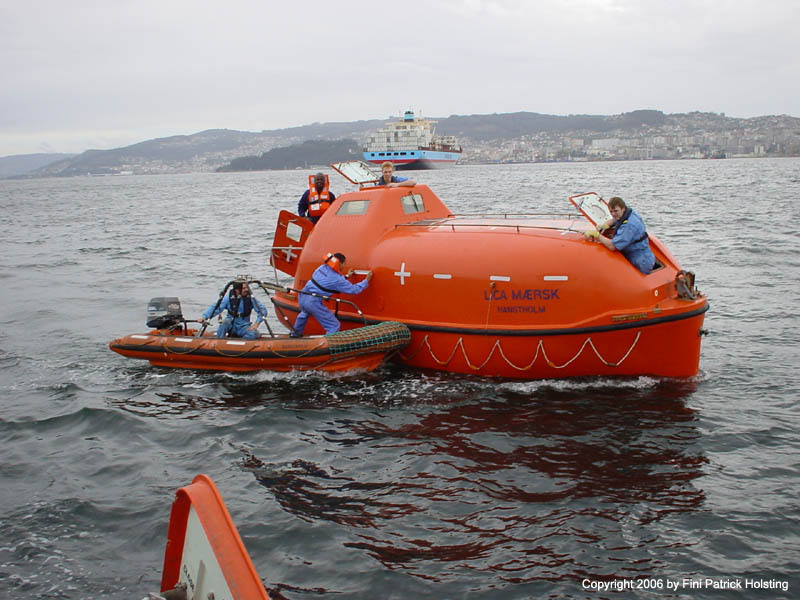 The life boat was entered this was, so that only one crew member had to be inside the boat during launch and recovery. In a real life emergency, the boat would be lowered with all crew inside. Since I was in charge of the life boat I remained inside and re-attached the hooks, enabling the life boat to be hoisted back on board. A rather exiting experience seeing and feeling the boat suddenly lift out of the water and go skywards! Just in front of the boat the top of the pilot ladder is visible. Now the life boat has nearly reached the davids (bottom left) which in turn will swing in to allow the life boat to reach its storage position. An Able Seaman is overlooking the life boat retrieval.